This action figure and vehicle set was constructed to look like the Kinnikuman manga books. When you open it up, there are some "comic" pages with directions for the car, instructions for games, and information about the characters. Also, there's a compartment with the figures and vehicle. Shown above is a scan of the front of the package, and below the back. 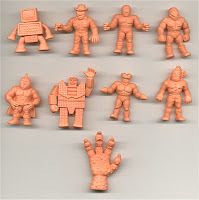 The set includes nine Kinnikuman figures, a car, and a launcher. 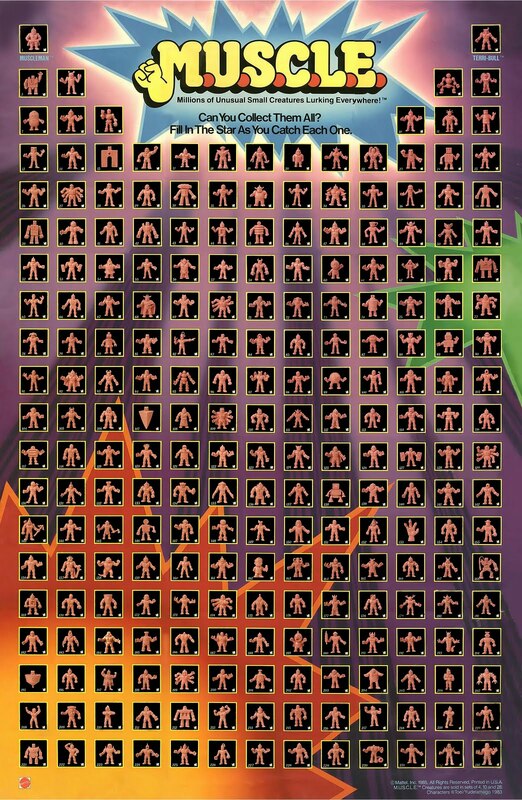 Click here for a scan of the figures. The car and launcher in the package was actually slightly different from the one shown on the back of the package. The "comic" section has directions for playing with the car. As far as I know, this is the only vehicle made for either the Kinnikuman or the M.U.S.C.L.E. line. When you open the cover, there are a few pages of cool illustrations of the characters included in the set! 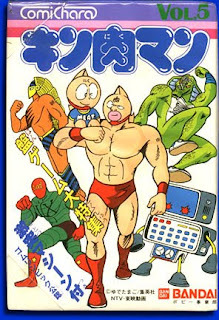 The first page (after the title page) shows Ramen Man, Sunshine, Kinnikuman, and Kanderaman (Lod IX). 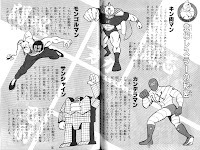 The next page has illustrations of Anmonaitosu, Sunigator Shotai (the Hand), Shyaneruman (Cowboy Muscleman), Personalman, and Screw Kid. 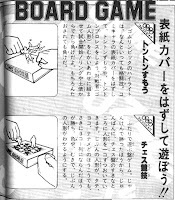 A few games are also explained in the "comic" section. The cup game seems pretty simple. You put two Kinnikumans in a cup, shake them around, and toss them down. Their positions determine how many points you get. There is also a board game. FYI, the top game shown is a traditional "sumo" game--normally, Japanese kids cut out paper "sumo" and then put them on a square cardboard box. They then tap the edge in an attempt to get their sumo to move forward. First one to fall loses. However, this version seems to be played with the game box and the figures...interesting. If you'd like to see a game of sumo played out on film, rent Beat Takeshi's "Sonatine." The other game seems to be chess from the name, but I can't make out the rules off the top of my head. There was only one version of the Comichara set to my knowledge, and the figures were the same for each set. Although the car doesn't really go well with the Kinnikuman concept, the packaging unifies the comic and figure line, and it's alot of fun!